Pratt was the neighborhood grouch. Somewhere in his seventies, he lived alone, kept to himself, and got pissed off more often and with less reason than anyone I’d ever met. I tried to speak–I really did–but no sound came out. When you turn around expecting to see something familiar–not particularly pleasant but familiar–and instead see something else altogether, it takes a little while for your brain to catch up with your eyes. Some people might call it shock. I call it the holy crap factor. Ernie Pratt was dead–very dead–which didn’t make much sense because as far as I knew, dead men didn’t get pissed. He was wearing what he usually wore in the mornings: a white terry-cloth robe and slippers, except the skin inside the slippers had gone as dry as old paper. His face was gray and pulled tight around his skull. One of his eyes was hanging out of its socket, dangling by a short length of thick, corded tissue. The other one, looking milky and sightless, nevertheless stared at me. His lips were gone, receded, revealing a black-gummed mouth with only half the teeth it should have had, and even those were as yellow as old eggs. Twelve year old Will Ritter wakes up one morning and realizes that his next-door neighbor has become a walking corpse. His day unfortunately goes from bad to worse when Will escapes on the school bus, only to realize when he gets to school that his assistant principal and math teacher are less than alive as well. 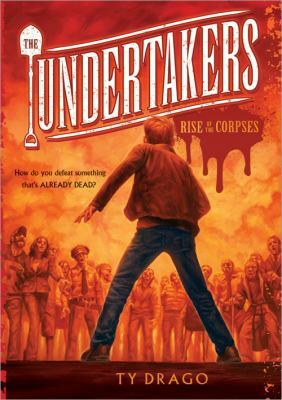 After being rescued by classmate Helene (pronounced like it has three a’s) , Will becomes involved in a secret organization of kids called the Undertakers who are among the few people able to identify these Corpses. Will is less than pleased about being drafted into their organization, but soon realizes that there are few other options. As the organization is forced to consider switching their tactics from defensive to offensive, Will just might be the recruit they need to tip the scales in humanity’s favor. My coworker and I were very intrigued when this book came in to see a zombie book for middle schoolers. How many other zombie books are out there for this age group? The cover is appropriately creepy and blood-red toned, which definitely adds to the appeal in my opinion. The story itself rises to the occasion as well. The zombies–excuse me, Corpses–are described in gruesome detail. In the dedication, the author thanks his son “who read it and offered helpful (and often profound) insight into the realities of his age, his culture, and his mysterious language.” It definitely shows, with the text riddled with mild cussing (crap, hell, pissed, etc.) that is definitely warranted and rings true to the horrific, scary, and adventurous outings that the teens experience. Will’s pleas for his mom at one point is also unique, because so many times in children’s books the main character is just thrust in their world saving position and blindly accepts their new role. Will doesn’t, and is really reluctant to joining this group and getting involved, and his actions realistically reflect what some scared tweens would be feeling. I really appreciated that aspect of the story. Another realistic aspect of the book: people die. Books where no one dies in an end of the world preservation fight really annoy me, and the fact that the characters were affected and mourned the loss of their fellow fighters is even more authentic. The fighters solve their problems with ingenuity, technology, physical confrontations, and a little bit of luck. Okay, in some cases a LOT of luck, with people coming to the rescue just in the nick of time on more than one occasion. But Ty Drago (even the author’s name is cool!) does an admirable job explaining these last-minute saves, and it works without any trepidation crossing your mind as you’re reading. It’s a fast paced, high energy novel that should get readers invested in the story. I could definitely see myself book talking this title to tweens and teens, especially around Halloween. There are twists and turns that readers don’t see coming, and although the ending is satisfying, it’s also open-ended enough to leave people excited about the sequel, Undertakers: Queen of the Dead which is coming out in October 1st (perfect again for Halloween!) AND there’s apparently a third one in the works too! UPDATE: I did book talk this to fifth and sixth graders during my summer reading visits, and they wanted to get their hands on it immediately, especially the boys.